The Most Rev. Michael Curry's installation sermon in video and text, and video of the entire installation. Favorite installation photos include the bishops lining the aisles with their vestments of red chimere over white rochet; and 27 and 26 as they prepare to asperge the congregation. Additional photo galleries here and here. Full coverage from Episcopal News Service. On Nov. 2 the presiding bishop published the video, A Word to the Church. "This is the Jesus Movement, and we are the Episcopal Church, the Episcopal branch of Jesus' movement in this world." 10: "This morning I lift my text from..."
EVERYONE: Anywhere but today's propers!" 9: "Now bear with me, I'm going somewhere with this!" 8: "God didn't put you on this earth just to use up oxygen!" 7: "I'm not going to be up here long"
6: "If you're breathing, God's calling"
5: "We have a God! And that God raised Jesus from the dead." EVERYONE: "I don't know how he did it, but he did!" 4: "When Israel was in Egypt land,"
EVERYONE (singing): Let my people GO! 3: "One more thing and then I'm going to sit down." 2: "There is a balm in Gilead"
And the Number one thing you are likely to hear in a Michael Curry sermon: GO!! On Saturday, June 27 at the 78th General Convention of the Episcopal Church, held in Salt Lake City, the Rt. Rev. 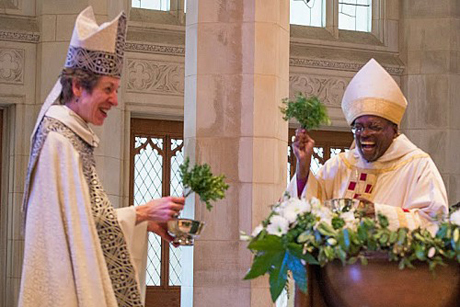 Michael Bruce Curry, bishop of North Carolina, was elected Presiding Bishop. He begins in that role in November of 2015. After morning worship at convention, the bishops left the Salt Palace for St. Mark's Cathedral (photo), to pray, discern, and vote for presiding bishop from four nominees. The election was not even close. Curry received 121 of the 174 votes cast by the bishops. And he received them on the first ballot, which was another first. A formal process. About an hour after the bishops departed convention, word was received by the deputies that bishop representatives were on their way to deliver word to the house committee. That meeting lasted some time, the wait was hard. There were one or two Twitter leaks, but no one knew for sure. Then word from the committee was announced to the House of Deputies. The bishops had chosen Michael Curry. Jubilation ensued. His election by the House of Bishops was confirmed by the House of Deputies by a vote of 800 to 12. Bishop Michael and his family, and the deputation from North Carolina made their way to the front platform (photo). The bishops joined deputies in the house for his introduction. Video. Bishop Michael's first press conference as presiding bishop-elect then took place. Video. PB-elect: The church needs to be a reconciling voice and agent in the public square, seeking to be a conversation partner in the community, a positive and proactive voice in the public square....It's the voice of the Christian community in Charleston that really did change the narrative, to a narrative of forgiveness and trying to find a different way. Where is the positive way forward? I do believe, profoundly, Dr. King was right, we are put here to create the beloved community. We all come from the same source, we are the brothers and sisters of each other. The hard work is to figure out how we live as a beloved community, as the human family of God. That's where the church and people of faith can join hands. Question: What is significance in your being first African American bishop of this church, also, would you describe yourself as evangelical? PB-elect: We'll see what terms get used about me. I think the election of Bishop Katharine as first woman--I was there and I remember realizing it was an experience of the Holy Spirit-- for real. Today I had that same feeling. I think that it's a sign of our church growing more deeply in the spirit of God, in the movement of God's spirit in the world. It is that way in Pentecost, people whose lives are really living in the spirit of God's love, and when that happens we find ourselves growing more in the direction of God's dream. My election, Katharine's election, these are a sign of that same thing--that the church is willing to grow and be all that God dreams it to be. Question: But are you an evangelical? PB-elect: Michael Curry is a follower of Jesus. Deputy Pat Glenn said, "It was a wonderful feeling to be a part of that process. I hope every member has the chance to hear Bishop Curry speak at some time!" Bishop Wayne said, "This man is happy, and he loves Jesus." Could there be more contagious traits? After the election, Bishop Wayne gave the presiding bishop-elect a fountain pen Bishop Michael had particularly admired. In a week full of news, media picked up this dramatic story of firsts, a small sampling of those links included below. The next morning Bishop Michael spoke eloquently at a Bishops United against Gun Violence pilgrimage. Video. "...My brother Bishop Sutton spoke earlier of an unholy trinity of problems of povery, racism and violence. And we are here because that unholy trinity has squelched life. We are here because that unholy trinity threatens the life of us all. But we are really here because there's another trinity. There is another trinity that is a Holy Trinity, a lifegiving trinity, of a God who is a creator, of a God who is a redeemer. God who is a sanctifier. I want to submit that we must be about the business of the Holy Trinity. The business of the Jesus who came and taught us, you have heard that it is said that life was cheap. You have heard that it was said that violence was the way, you have heard that it was said that racism is okay, you have heard that it was said that poverty doesn't matter, but I say unto you Love your enemies. Bless those who curse you. Love the Lord your God and neighbor as yourself, We're here because of that trinity. And it is there my brothers and sisters that we will find the common ground..."
To his remaining days at this working convention were added hundreds of selfies and group photos, much to the delight of all. Bishop Michael preached at the final worship service of convention, "GO!" Video. At the worship service, Presiding Bishop Katharine read a letter of congratualtions to him (photo). We sat on the edges of our chairs with him wondering from whom until she read the signature, President Barack Obama. Video. Video class on ChurchNext, "Crazy Christians"